Americans on a budget are trying to get the most value for their money seen by an increase in season pass sales, but summer tourism – the parks’ busiest season – also boosted earnings. Six Flags Entertainment Corp. is betting on new attractions and season pass sales to help it reach new profit goals in coming years. 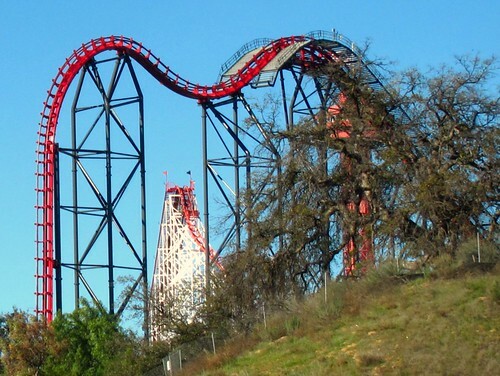 Six Flags’ net income increased 29 percent from last year. Photo by Jeremy Thompson. The company, which owns the Great Escape properties in Queensbury, filed its third-quarter financial results with the Securities and Exchange Commission on Wednesday. The firm posted net income of $272 million for the three months that ended Sept. 30, a nearly 29 percent increase from the $211 million bottom line the company posted for the same quarter of 2011. Revenue for the third quarter — considered the company’s most important because it includes the summer tourism season — reached $485 million, about 2 percent greater than revenue of $476 million for the third quarter of 2011. The company credited a greater percentage of season pass holders with helping to boost revenue, as those customers tend to provide greater profit to Six Flags over the course of the season. Total attendance — at all of the company’s 19 parks — grew by 3 percent year to year, to 11.5 million guests. The company does not break out attendance for individual parks. The company also increased its quarterly dividend by 50 percent to 90 cents per share, payable Dec. 10 to shareholders of record as of Nov. 27, according to the company’s financial report. The Great Escape properties in Queensbury announced this month it would hire about 50 year-round employees to work in the Six Flags Great Escape Lodge and Indoor Waterpark, located across Route 9 from the amusement park. The local park also announced in late August it plans to add a new swing-like ride called Screamin’ Eagles for the 2013 season. (c)2012 The Post Star (Glens Falls, N.Y.). Distributed by MCT Information Services.